Stylish yet elegant Dining Set perfect to stylize your home. Aarsun Woods have been in Handcrafted Furniture domain for quite sometime now. Having a considerable amount of time spent in improving upon the designs and finish, we now brings to you Wooden Dining Set made in premium Teak Wood (Sagwan) with Gold Polish.The Dining chair similar as dining table with Gold Finish and texture pattern. 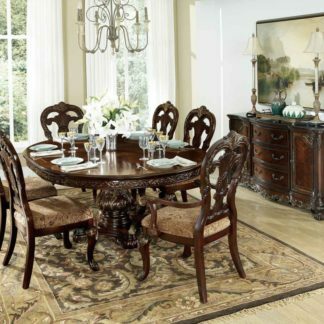 The set has intricate carvings all over the surface and can easily facilitate 8 family members.The Dining Sets are an important piece of furniture as it embarks decency and at the same time gives a sense of togetherness. The Dining Set reflects the skill and experience of the artisans of Saharanpur. Each unit is skillfully crafted piece by piece with its own unique design and carvings. The Dining Table has a rectangular base with curved edges. The surface displays beautiful creepers design reflecting the Arabian Arts with heavily crafted tidal waves at the legs.